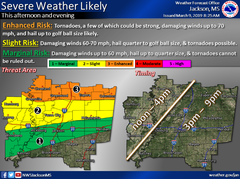 ENHANCED Risk of Severe Weather - Damaging winds 60-70 mph, large hail to golf ball size and tornadoes possible. Slight Risk of Flash Flooding - 1-2 inches of rain with locally higher amounts possible. 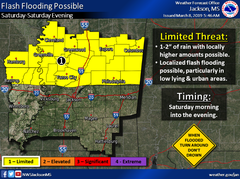 Localized flash flooding possible, particulary in low lying and urban areas. Have a DISASTER PLAN, DISASTER SUPPLY KIT and a DISASTER COMMUNICATIONS PLAN.